« Melbourne food & wine festival: the Food Truck Jam! Friday night is usually reserved for home delivered Thai and trashy reality television (Geordie Shore is my current favourite. Init), so it’s a little unusual for us to go out for dinner. However, we couldn’t pass up the opportunity to visit the newly opened Mexican restaurant Senoritas, on opening night no less. 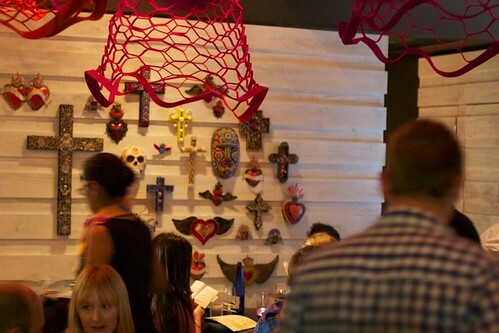 It’s never been a better time to love Mexican food and live in Melbourne. Every state north of Victoria refers to us as Mexicans, so we may as well enjoy the benefit of eating their lovely food. I was running a little late for dinner, so I quickly whipped out the camera and started taking photos of the exterior, after which I then proceeded inside. Unfortunately, I hadn’t been paying attention when Marg mentioned where we were having dinner, and I ended up inside San Telmo, walking around aimlessly taking photos of the wrong restaurant. Having not eaten in San Telmo yet, I can tell you that the fit out is amazing. After locating the correct restaurant on Meyer’s Place, I was really impressed by the attention to detail in Senoritas. The drinks menu is in a little book styled like a Mexican Passport, and the food menu itself is an assault of colour and dishes. The restaurant is very dark inside (hence the dubious quality of the photos), and the walls are covered with paintings of skulled ladies. Unusually seductive. The service was dangerously good, with an empty beer bottle never staying on the table for more than 30 seconds. The staff carefully explained all the dishes, and were more than happy to answer our questions of confusion regarding the menu (more on that later). Our first course arrived in dribs and drabs, but that’s something I’d put down to opening night, as our selection of main dishes all came out together. There is unfortunately, a rather expensive but. 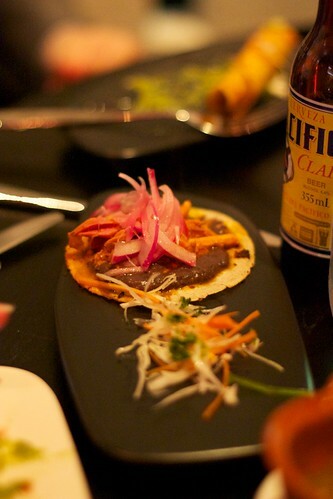 Although a little controversial with my fellow dinners, I loved almost all the dishes, particularly the Tacos Yucatecos. But it was just a little too expensive for what it was. This was a single taco, which cost $9.50 and wouldn’t have been more than 3 inches in diameter. To put it into perspective, a taco at Mamasita costs $6 and is 6 inches in diameter. That’s half the taco for 30% more coin. Price per inch, you’d need to spend $18 to get the same quantity of taco, making it three times more expensive. The corn chips were another area of fiscal recklessness. The corn chips, featured below were $4 a serve, and each serve came with no more than 10 corn chips. That’s 40 cents a corn chip. Again, they were good cornchips, but were they 40cents a chip good? If you applied that pricing to a can of regular Pringles, you’d be paying $32 a can. The food was very good, but it was bad value in both price and quantity. 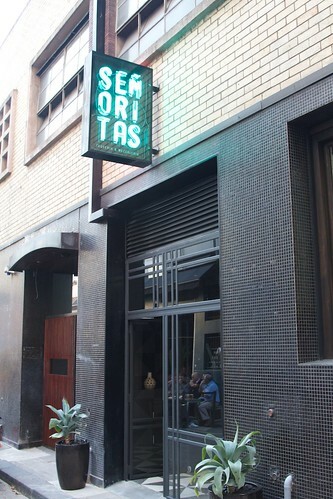 So it’s delicious and expensive, but it is it better than Mamasita, Melbourne’s current Mexican darling? The service is definitely better, and for me the food was better, but it’s also more expensive and you got less food. And Mamasita isn’t particularly good value for money in the first place. For me, the higher quality food probably tips it in Senioritas’ favour, but this increasingly smaller portion sizing is something that I’m not particularly enjoying. I first heard about Senoritas opening over 6 months ago. Over that time there had been a number of mentions in newspaper articles, blog posts, tweets and so on. I think it’s fair to say that there was a lot of build up to its opening, and I was pretty excited. 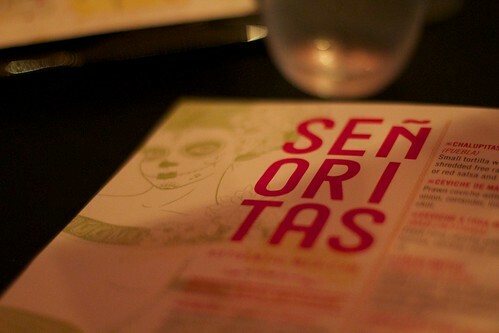 I should point out first thing that we visited Senoritas on its opening night. Because it was opening night we went in with open minds, ready to experience messy service and any other first night hiccups. It didn’t take long for us to get some either – I called on Tuesday to make a booking and was told that I was booked in and would get a call later in the week to confirm, at 4.30 on Friday I got a call confirming my booking (all good so far), yet when we turned up at 6pm we were told that there was no record of our booking. Luckily there was a table available anyway (presumably the table that we had booked, given that there were no other free tables and it was coincidently set for 6 people). As I said though, it was opening night so I’m not going to judge for that mix up (and to Senoritas’ credit, it was handled very well). Our service for the rest of the night was great. 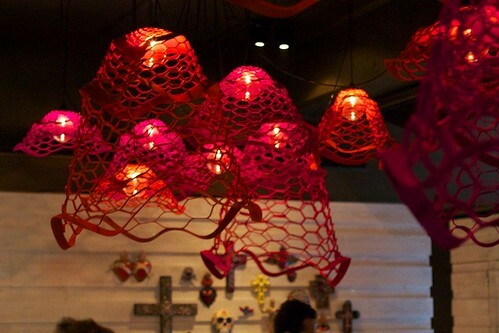 The fit out was great too, with white walls decorated with skulls and fancy red light fittings reminiscent of full traditional mexican skirts, it’s certainly a nice looking space. It’s just a shame that you can’t see a lot of it. While the light fittings are great to look at, they don’t really spread a lot of light. Senoritas is dark. Using your phone as a torch to be able to read the drinks menu kind of dark. It was also loud enough that I couldn’t have a conversation at the table. Ok, I realise that I sound like I’m 80, maybe it’s Senoritas and not me though – I think it’s a bad sign when a group of mid-20s think somewhere is too loud. Now, the food. The food was fine, most of it was good, none of it was great. My real issue was the price, dinner for 6 of us cost $400. Even if you exclude the beers the food worked out at $50 a head. Now $50 a head doesn’t sound completely unreasonable, it’s certainly not the most expensive meal I’ve ever had, but it’s not the price as such that was a problem, it was the value for money. The first thing I did when I got home after dinner was have a snack, I also had a message from my best friend after we left that just said “I’m so hungry!”. Personally, I believe that when you spend $50 on food you shouldn’t be figuring out where to get a top up on the way home. Maybe the size of the portions (and the dark, loud atmosphere) has something to do with the target crowd. I know that it was opening night so it’s likely that a lot of the guests were friends of the owners or staff, but there was a very distinct type of diner at Senoritas on Friday – lots of tanned pseudo-european men with a couple too many buttons unbuttoned having dinner with 6 foot tall girls. Basically most people looked like models, to the point where we actually wondered if it was some sort of unofficial fashion festival after-party. All 5 foot 3″ of me has rarely felt so out of place. The question of the night for most of us was the comparison between Senoritas and it’s direct competitor, Mamasita. Which would we go to if we had a choice? The group was split, but personally, despite the higher prices, I would go Senoritas because I thought the food was better. We all agreed though that if we had a choice to go to Senoritas, Mamasita or somewhere else, we’d be going somewhere else. The menu at Senoritas is fairly large and potentially overwhelming. We were told that the first two columns of the menu are smaller plates, the third column is larger plates and the fourth is sides/desserts. As a general guide, for the 6 of us we ordered 2 smaller plates per person and then shared 2 larger plates, 4 sides and 3 desserts. Now, before I get on to the food itself, one issue that I want to point out – although the menu is designed to be shared, most of the smaller plates have only 1 item (e.g. 1 taco), 2 at most. Because of that we found that they weren’t actually all that easy to share, so we’d probably recommend just ordering a couple for yourself (and sharing any that happen to have 2 serves). Panuchos de Cochinita Pibil (slow roast pork in a small tortilla with refried black beans, pickled red onions and salsa – $7.50). This was tasty, but to be honest it wasn’t $7.50 worth of taco. The key word here is small. 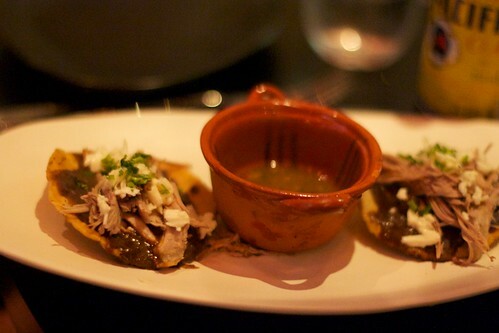 Sopes de Pato al Tamarindo (tortilla topped with poached duck, tamarind mole and queso fresco – 2 for $9). This was probably my favourite dish of the night. With a particularly crispy and thick tortilla it wasn’t super easy to eat though (and certainly wasn’t suitable for folding/rolling). 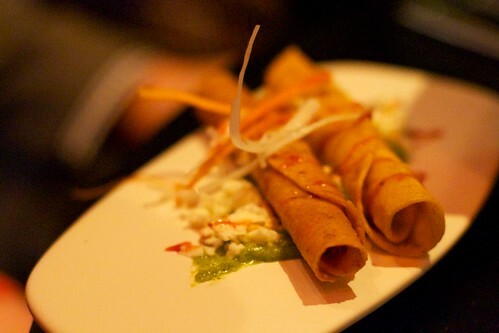 Flautas Viva Mexico (crisp-fried duck taco with guacamole, queso fresco and dried chilli sauce – 2 for $10). 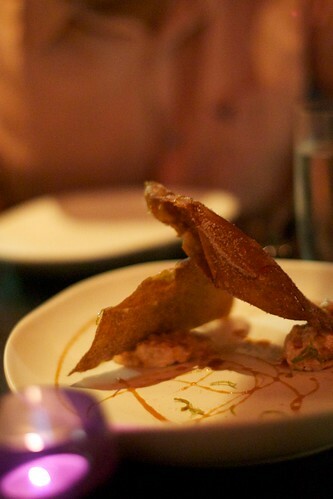 Now when you read crisp-fried duck taco, what do you think of? Personally I expected a taco with a filling of crisp-fried duck. Apparently my menu interpreting skills weren’t at their best though because I was surprised when the dish was actually duck tacos, rolled up and then fried as a whole, resulting in a crunchy taco roll up. They were good (particularly the guacamole and chilli sauce, the duck was a little dry), just not what I was expecting. Maybe it would be more accurate to describe it as a crisp-fried taco with duck etc. Ok, that’s my clarity in menu rant over for now. 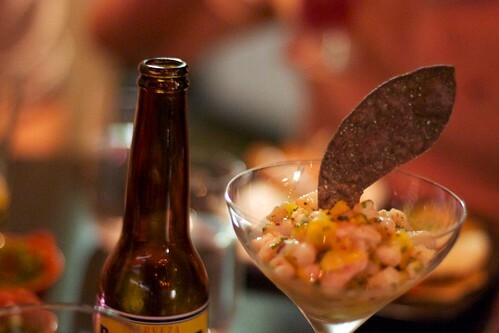 Ceviche de Mango (prawn ceviche with mango, spanish onion, coriander, lime and serrano chili – $13). Gerard and I didn’t actually try this but it certainly looked impressive. 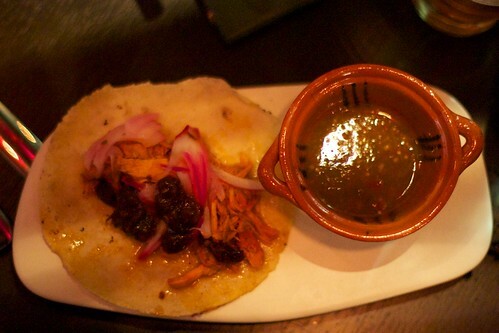 Tacos Yucatecos (slow roasted Mexican style pork taco with pickled onions and salsa – $9.50). Again this was a 1 per serve item and at $9.50, perhaps the most expensive taco in Melbourne. At approximately 3 inches across, it is certainly not the largest taco in Melbourne. Maybe that’s forgivable though given that Gerard said it may well have been the best pork taco he’s ever eaten. 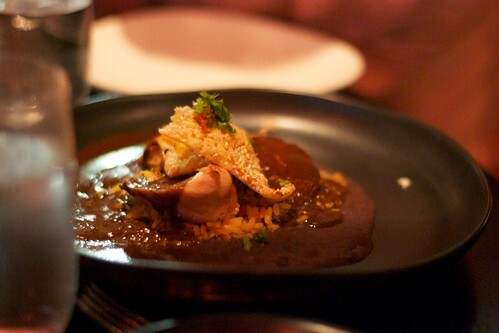 From the ‘larger’ plates section of the menu (or the ‘master plates’ as the waitress described them, not sure if that was intentional or a language issue) we tried the Mole Poblano con Pollo (chicken breast with mole poblano, mexican rice, refried beans and a cheese and sesame wafter – $32). The mole itself was really good. The chicken? Well the chicken was a little sparse. And overcooked. The overcooking I’m happy to put down to opening day issues, the quantity is a different story. 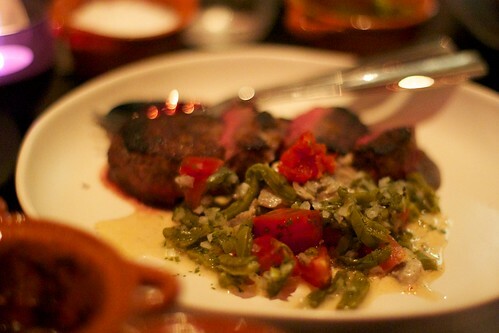 We also had the Arrachera Divorciada (sirloin steak with refried beans, cactus salad, mushroom and chipotle salsa – $28). This was fine, nothing to write home about though. The salsa selection ($10 for 3 different salsas of varying spiciness). The salsas were fine. A quick warning though, when they say that they’re spicy, they mean it. We also had 2 serves of the guacamole ($6 each). Throughout dinner we had 4 serves of corn chips, if you can call approx 10 chips a serve ($4 each! How much does corn cost these days?). 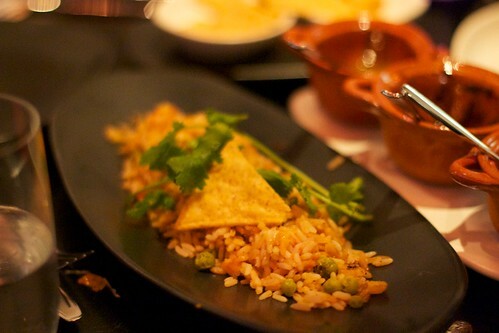 Arroz a la Mexicana (tomato flavoured rice with peas, corn and carrots – $6). This was a bit of a zero value add, fine, but essentially non-delicious filler. Frijoles Refritos (black refried beans with queso fresco – $6). The refried beans were good, but as with many of the other dishes the quantity let it down (even though we had 2 serves), especially when being shared between a number of people. After all that (which on paper sounds like a lot of food) we were all still pretty hungry so decided to order dessert. There are 3 desserts on the menu and we ordered 1 of each. 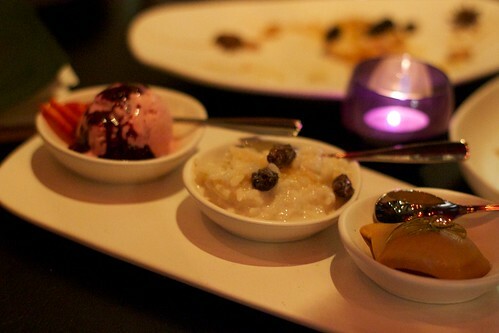 First up was the Trilogia Mexicana (homemade strawberry ice cream, caramel mousse and anise rice pudding – $10). While each element of this dessert was good in itself, it was a little unclear what they were all doing together. When I say a little unclear, I mean that it made no sense at all. 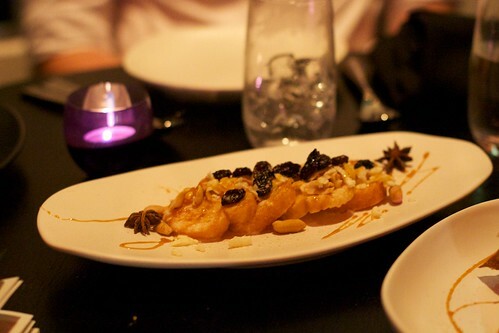 We also tried the Capirotada (Mexican bread pudding with brown sugar cane, peanuts, raisins and queso fresco – $10). I really enjoyed this, I think it was my favourite dish after the poached duck tacos. The last dessert was the Bunuelos a la Mexicana (sweet tortilla Mexican style with cinnamon sugar, guava, cream cheese and piloncillo syrup – $11). From the little I had, I really enjoyed this, mainly for the cream cheese, I love cream cheese. The food at Senoritas is good (but not amazing) but if you want to have a proper dinner expect to pay through the nose for it, or to walk away hungry. Also don’t expect to see or hear much in the restaurant. The food was very good, but the lack of value was definitely an issue. A better experience overall than Mamasita’s, but it’s going to cost you. This entry was posted in Eating out and tagged CBD, mexican. Bookmark the permalink. Trackbacks are closed, but you can post a comment. I disagree with your comments about Senoritas being too expense!!! you need to pay for quality, which Senoritas delivers on! Thanks for your comment. I agree that you have to pay for quality (although some of my favourite restaurants are also the cheapest). We thought that the food was good, just not good enough to justify the price. Personally, I don’t think a $9.50 on-the-small-side-taco is good value unless it’s absolutely amazing. It wasn’t my idea of value, but I’m glad other people are enjoying Senoritas. It’s a well executed idea and I’m sure it’ll be very popular. I agree – and am MORE than happy to pay for quality – when it’s due. But by the looks of the pictures of Señoritas you need to pay for their fancy light fittings & dia de los muertos decorations. Mexican is not meant to be “fancy” or expensive. Clean, crisp, simple flavours is what it’s all about….to me, a $9.50 taco is just ridiculous – I don’t care how good it is. Would go there, but probably only with my beloved and not in a group. Haha, Gerard loves some good fiscal responsibility! I definitely think it’s worth trying, the food was pretty good.